Club Deportes Castro (Liga Nacional) added to their roster experienced 34-year old American shooting guard Walter Baxley (193-90kg-84, college: Mars Hill). 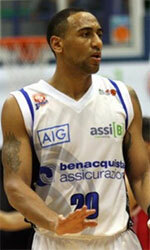 He played last summer at Olimpia in Paraguayan Metropolitan League. He helped them to win the league title despite they ended the regular season at the second place. The last season Baxley played at Bigua (LUB) in league where in 11 games he recorded very impressive stats: 25.9ppg, 3.3rpg, 2.5apg and 1.5spg. He was also named League Player of the Week. He also spent pre-season at Quilmes (LigaA) in Argentinian league. Baxley was also tried-out by Ferrocarril (LigaA) in Argentinian league. The list of the past achievements is quite long as among others he was voted Latinbasket.com All-Argentinian LigaA Guard of the Year in 2016. Baxley is quite experienced player. Thanks to his pro career he managed to play on three different continents (Europe, Latin America and of course North America) in ten different countries. 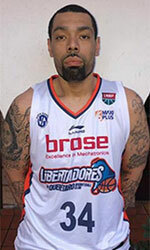 Baxley has played previously professionally in Dominican Rep., Finland (Kauhajoki and Lapuan Korikobrat), Germany (ratiopharm Ulm), Iran, Poland, Venezuela (Bucaneros), Uruguay (Defensor and Hebraica), Argentina (Atenas), Dominican Republic (Indios de San Francisco) and Chile (Puerto Montt). He attended Mars Hill College until 2006 and it will be his 13th (hopefully lucky) (!!!) season as a professional player.